The premium results you want, in the size you need. The PIXMA TS9120 is the ultimate all-in-one home printer for all your needs - not only is it compact with its sleek size, but it is designed to deliver exceptional results. This printer can handle it all - from homework assignments, shopping lists, invitations and concert tickets to stunning family photos. Achieve photo lab results thanks to a 6-Color individual ink system with a photo Blue ink for reduced graininess and even add creative Filters to your photos right on the impressive 5.0" LCD touchscreen. Inspire your creativity with prints that will impress. From stunning photographs to detailed documents, put the 6-color individual ink system to work and never compromise on speed or quality. Enjoy the simplicity of connecting your smartphone, tablet and all your favorite devices with ease. Print hassle free - whether from the cloud, through Bluetooth, from social media or even on the go. The PIXMA TS9120 Wireless printer is the all-in-one that fits perfectly anywhere in the home, and looks great with any decor thanks to its two-tone design and multiple color options. 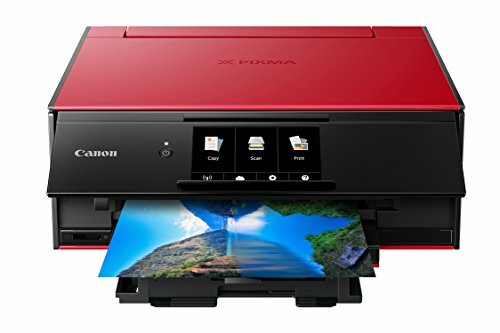 With intuitive features like the 5.0" LCD touchscreen and enhanced user interface, Bluetooth printing, & document removal reminder, it's clear to see why the PIXMA TS9120 makes printing a breeze.